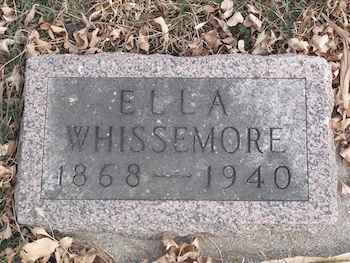 Ella was named as a beneficiary in her father Orlin's will made at Winnebago, Faribault County, MinnesotaG, on 4 August 1905. She was to share with her sisters Mina and Emma some 80 acres of land. Charles Weygant, The Sacketts of America, not recorded. "Minnesota Death Index 1908–2002", database, Ancestry.com. Email from Lois Landvoigt to Sackett mailing list, Jan 2019. Sackett, Elton, 1, b. Minnesota. Emma Sackett, dau, 3, b. MN, father b. NY, mother b. ME. Conklin, Maudie, dau, b. Dec 1892, 7, b. MN, father b. MN, mother b. MN. Conklin, Maud E, son, 17, b. MN, father b. MN, mother b. MN. Conklin, Ella, mother-in-law, 52, wid, b. MN, father b. NY, mother b. OH.